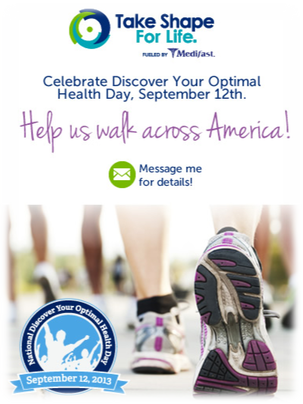 When: Thursday, September 12, 6:00 p.m.
Take part in our one-mile "Walking For Optimal Health" walk. in support of nationwide efforts to get America healthy! Socializing, healthy snacking, prize drawings, free health screenings (blood pressure, blood sugar, body fat %), vendor booths, and much more! "Discover Your Optimal Health" presentation. Learn what optimal health looks like and how to discover yours. We hope you'll join us. We look forward to seeing you!